NOTICE: Before inspecting the wheel alignment, adjust the vehicle height to the specified value. If the vehicle height is not the specified value, try to adjust it by pushing down on or lifting the body. Follow the specific instructions of the equipment manufacturer. If the steering axis inclination is not within the specified value, after the camber and caster have been correctly adjusted, recheck the steering knuckle and front wheel for bearing or looseness. NOTICE: After the camber has been adjusted, inspect the toe-in. (a) Loosen the front and/or rear adjusting cam nuts. 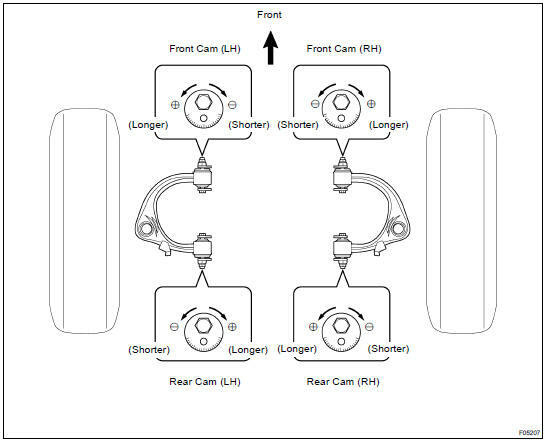 (b) Adjust the camber and caster by front and/or rear adjusting cams. 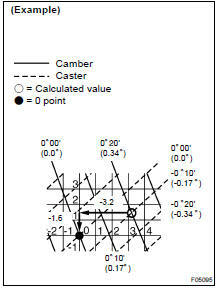 HINT: Try to adjust the camber and caster to the center of the specified value. (c) How to read adjustment chart (using examples). Mark the difference between the standard value (A) and the measured value (B) on the adjustment chart. 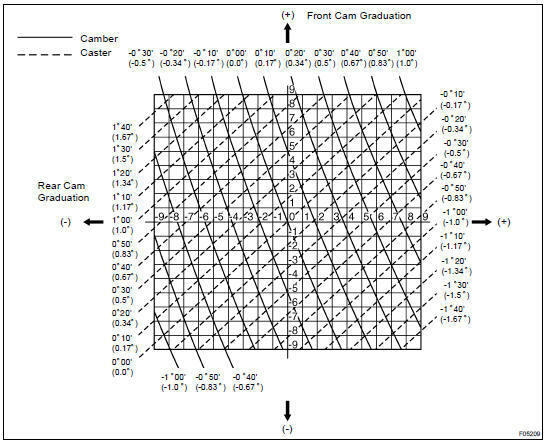 As shown in the chart, read the distances from the marked point to 0 point, and adjust the front and/or rear adjusting cams accordingly. (d) Torque the front and/or rear adjusting cam nuts. If the toe-in is not within the specified value, adjust it at the rack ends. (a) Check or adjust the lengths of the rack ends, then adjust the toe-in. (b) Remove the boot clamps. (c) Loosen the tie rod end lock nuts. (d) Turn the right and left rack ends by an equal amount to adjust the toe-in. HINT: Try to adjust the toe-in to the center of the specified value. (e) Tighten the tie rod end lock nuts. (f) Place the boots on the seats and install the clamps. HINT: Make sure that the boots are not twisted. (g) Perform the zero point calibration of yaw rate and deceleration sensor (DI-505 ). (a) Turn the steering wheel fully, and measure the turning angle. 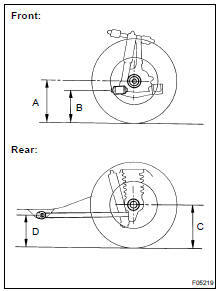 (b) When toe-in is normal after inspection, adjust wheel angle with the knuckle stopper bolt of the lower suspension arm.